Make a box of melt-in-your-mouth chocolate truffles at home with this DIY kit. You're in for a treat with this easy-to-use kit that allows you to make a box of melt-in-your-mouth chocolate truffles at home. Once the organic dark chocolate morsels are melted using either your stovetop or microwave, amateur chocolatiers can customize their creations by mixing in any of the included coconut flakes, peppermint, vanilla, or Himalayan sea salt. Add cream to make your bon-bons milk chocolate, or coconut milk to keep them vegan. Add a decadent dimension to your date night, personalize your Valentine's Day present, or satisfy your sweet tooth and your creative side in one fell swoop. Assembled in Portland, Oregon. Click here for instructions for making chocolate truffles. Store at room temperature between 60-80 degrees. Just add cream. Or coconut cream for a vegan option! 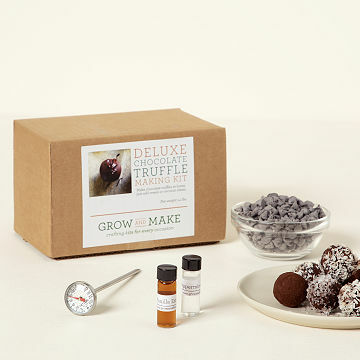 I thought that as a DIY Kit it would include everything necessary to make truffles. Unfortunately, parchment paper is not included. That would have been a nice touch. You will also need a double boiler. I thought that should have been mentioned on the box. And a melon baller is suggested, I don't have one. The actual ingredients are not very sophisticated. There is nothing included that I don't already have in my kitchen - chocolate chips, cocoa powder, coconut flakes, sea salt, vanilla extract, and peppermint extract. Beyond that, the kit only includes a mini cooking thermometer and instructions... if they had sent parchment paper and a melon baller the kit would have been useful as those are the items I don't have! As for making beautiful truffles? Ours looked more like chocolate blobs, but I will blame that on our cooking skills. Really I was just disappointed with the kit as it seemed very rudimentary. Perfect Gift for the Couple that LOVES to cook together! This gift was just perfect especially since they got to learn how to make truffles in their own kitchen and then get to enjoy the time they spent together making this fabulous sweet treat! I gave this to my sister and brother-in-law as a gift. My sister is an experienced cook and baker. She said it was pretty much a disaster. The ganache didn't set up no matter how long she left it in the freezer, so she couldn't dip the balls and just had to dump the chocolate over them. She said they tasted good, but they sure looked awful. I was really disappointed and kind of ashamed that I had given this as a gift. Fun time, learned how to make truffles. This was a fun little kit that allowed us to learn about making truffles and had a pile of treats at the end. The only problem I had was there was so many I *had* to bring them to work to share...a good problem to have! Simple recipes, easy to follow & had good suggestions for altering. I made chocolate with toasted coconut, raspberry and peppermint. All were well received as gifts to others and delicious. Neat little kit too, several things left over with some more base chocolate. Perfect way for couples to share. Delicious, fun, experience-oriented gift (but easy). Buy a few and do them with the whole family! Going to use in a Christmas Yankee Swap which includes adults and kids.